Mystery of the Tarot Video Slot Review - Casino Answers! Mystery of the Tarot is a 5-reel, 9-line video slot developed by Random Logic, featuring a wild symbol and two bonus games. You can play the Mystery of the Tarot video slot at Bovada. Bets on the Mystery of the Tarot slot machine are $0.05, $0.10, $0.25, $0.50, $1, $2, $5 and $10 per line. 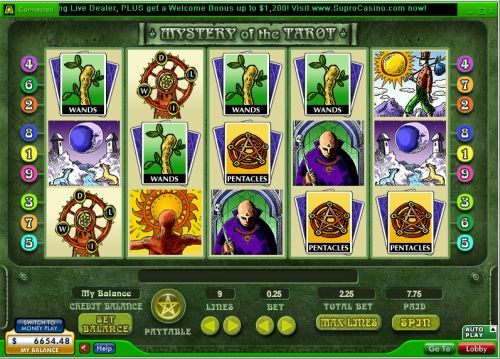 You can select 1-9 paylines on the Mystery of the Tarot online slot. You can bet anywhere from a nickel per spin up to the maximum total bet of $90 per spin. Mystery of the Tarot has a good betting range, suitable for most online slots players. To play the Mystery of the Tarot video slot, select your bet and press the “Spin” button. You can also use the “Max Lines” button to play all 9 paylines. The top payout symbol on the Mystery of the Tarot slot game is the Wheel symbol. If you land 5 Wheel symbols on an active payline, you will win the 10,000 coin top jackpot. The Wheel symbol is wild and will substitute for any symbol, except for the scatter and bonus symbols. The next highest paying symbol is the Fool symbol, which can pay up to 2500 coins. When the Scattered World symbol appears anywhere on reel 1 and 5, you will trigger the Cards of Destiny bonus game. You will pick a Past card, a Present card and a Future card. You will be awarded a prize for each card you select. Find out what your destiny is with the Cards of Destiny bonus game at Bovada! All symbols pay left to right on consecutive reels, except for scatter and bonus symbols. All wins are multiplied by the bet per line, except for scatter wins, which are multiplied by the total bet. Scatter and bonus wins are paid in addition to payline wins. Only highest win paid on each of the active paylines. Mystery of the Tarot has a basic autoplay mode. To use it, open up the Mystery of the Tarot autoplay mode by pressing the Up arrow on the “Auto Play” box. You can play up to 99 autoplay spins on the Mystery of the Tarot online slot. You can stop the autoplay mode at any time by pressing the “Stop” button. Mystery of the Tarot has two very good bonus games and a great top payout. There are no scatter payouts or a free spins feature. As far as the presentation goes, it could be better, but not horrible. You can play the Mystery of the Tarot video slot when you sign up at Bovada. 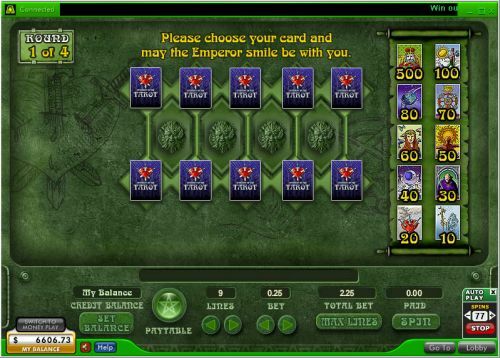 Can players from the United States play the Mystery of the Tarot online slot game for real money? No, American players are unable to play the Mystery of the Tarot video slot for real money. Fortunately, you can play a similarly themed USA-friendly video slot called Future Fortunes at Bovada.